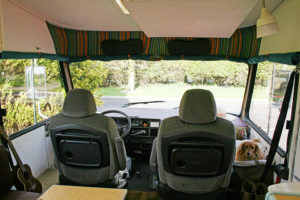 For years my boyfriend and I have been saving and planning for a tour around Europe in a motorhome. After a long time of planning and a long learning curve, which we’re still on, we are ready to leave. I hope to paint in many new places and find new outlets for my work. I also hope to join up with some pastel societies and artist groups to exhibit with, as well as experience discovering new places and taking a litte time out to explore. I can’t wait to see what spectacular landscape and wildlife many other countries have to show me! 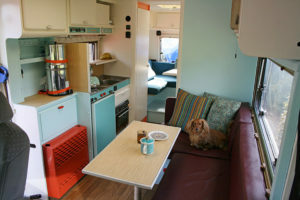 I thought I would share with you our motorhome and her new look! 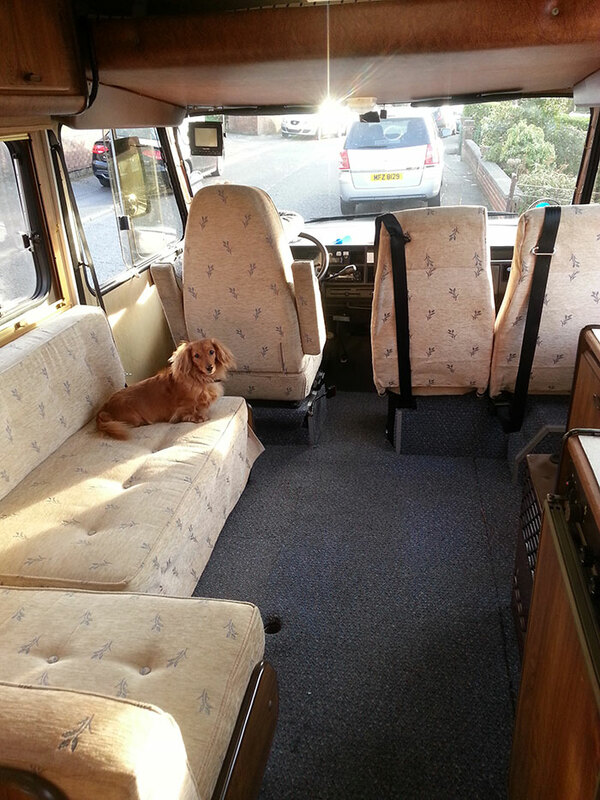 We bought a very old vehicle with a lot of potential to be a lovely space to live and work in. 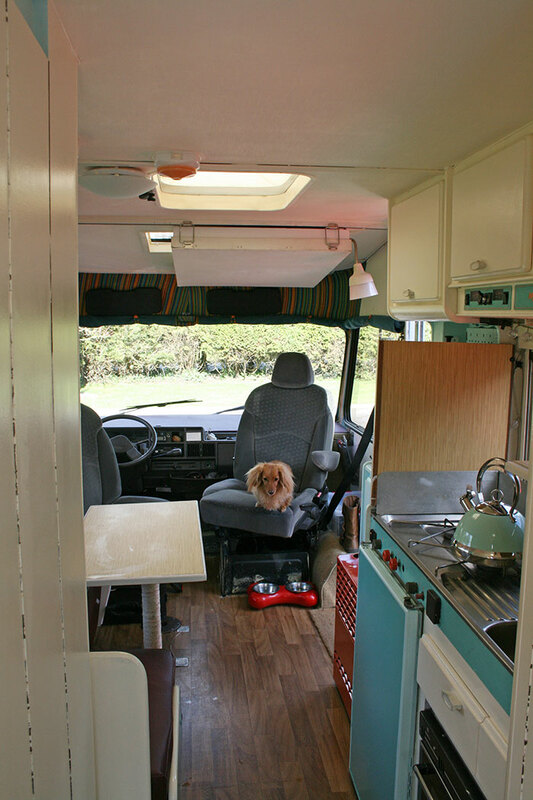 Over the past months Andrew and I have worked during our spare time to completely change the look of Freda (our motorhome is called Freda Roam in full as that’s what we are now!). 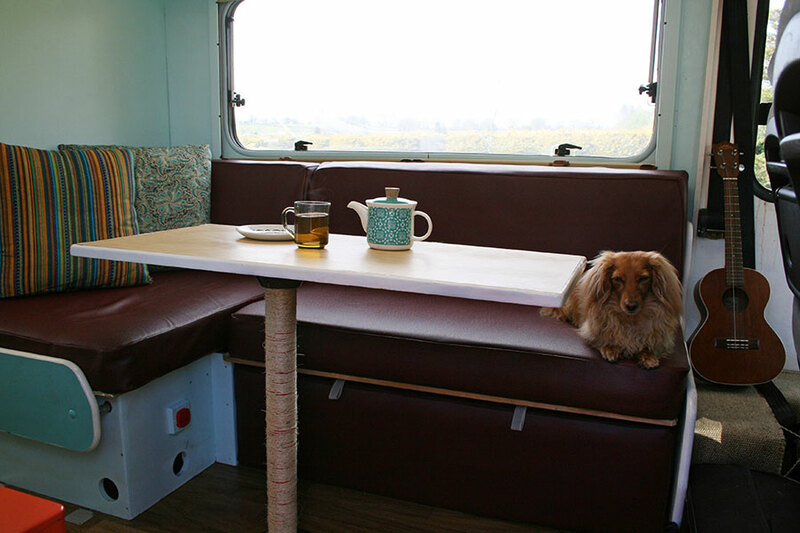 Whilst I loved the retro look of the brown veneer which was original to the Hymer look, I felt I needed more light to work in. I know I normally share progress pictures of paintings, but this has taken a big creative effort from us both, so I thought you might be interested to see the creation of my studio/home on wheels! This was how Freda looked when we got her. In very good order but quite dark. The light parts were the seats, and dirty Brocci paws would soon make them darker! 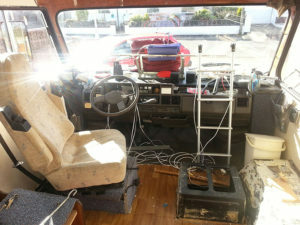 We took the carpet out first and this is how we toured around Ireland last year. 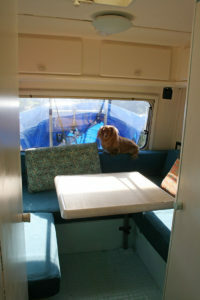 We enjoyed our time in here so much and spent more time living outdoors in the lovely nature spots where we stayed. 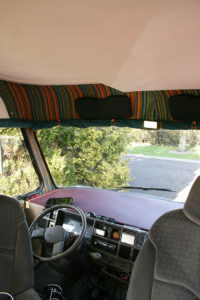 But, we felt we needed to brighten the interior up with more than just new upholstery and cushions. The darkness came from the brown veneer and I found I needed a daylight lamp on in here to work even during the day. This shows our starting point in choosing the palette. 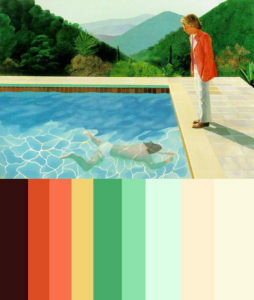 I love this David Hockney painting and the colours he uses create a warm light that makes you want to be there. Other than the greens in the middle which were impossible to find in fabrics, I think we managed to incorporate this palette in the final look and it feels a bit like being in a sunny hockney or a time warp from the 1950s/60s with a few touches from the 70s! Our finished living area. These motors are so well built, they really thought of everything! The storage space is brilliant and I have my entire art kit on board. We kept the cost of our makeover down by doing everything ourselves from the painting to upholstering to fitting a new water pump and sorting out wiring etc. 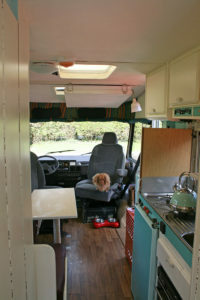 There is always much to learn in a motorhome but it’s a challenge we both enjoy! The back lounge transforms into a king size bed. It also doubles up as my work area and this swivel table is great for an easel. All those cupboards above store my pastels and my easel is hidden under a seat here. Very quick to set up and get going! This shot shows my art storage above Brocci. This lowers down so I can access it easily and I store all my drawing boards, paper storage etc. It’s about A0 in size and to be honest I’ve never had a good storage place for big paper so this is better than any studio storage I’ve had! This is a view of the front while it was in chaos! 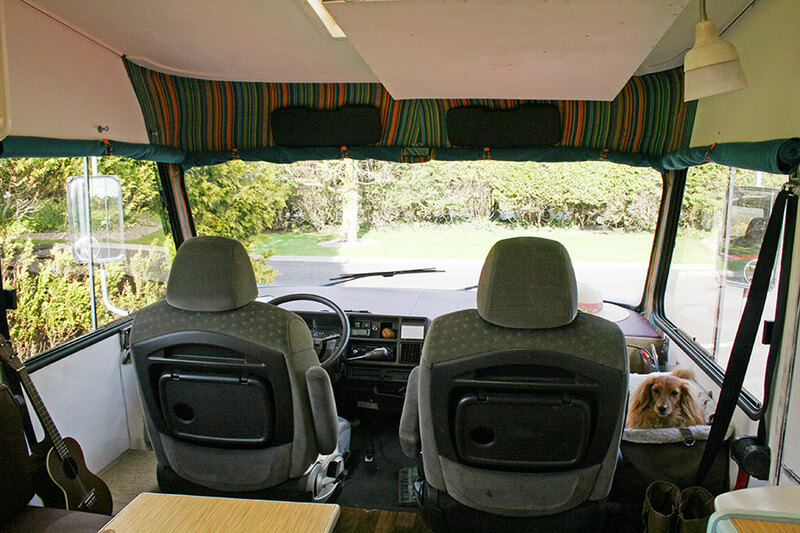 We removed the two coach seats at the front so we could have two captain seats which would allow the room to open up more. Brocci has a spot up front where her bed sits up level with the window as we drive. She’ll be able to see out and thankfully she travels really well. She loves barking at people out the window and is always happy to be along on the adventure. The front booth area where we eat and chill out in the evenings. I hope to be able to share updates from around Europe with you as well as my art progress. 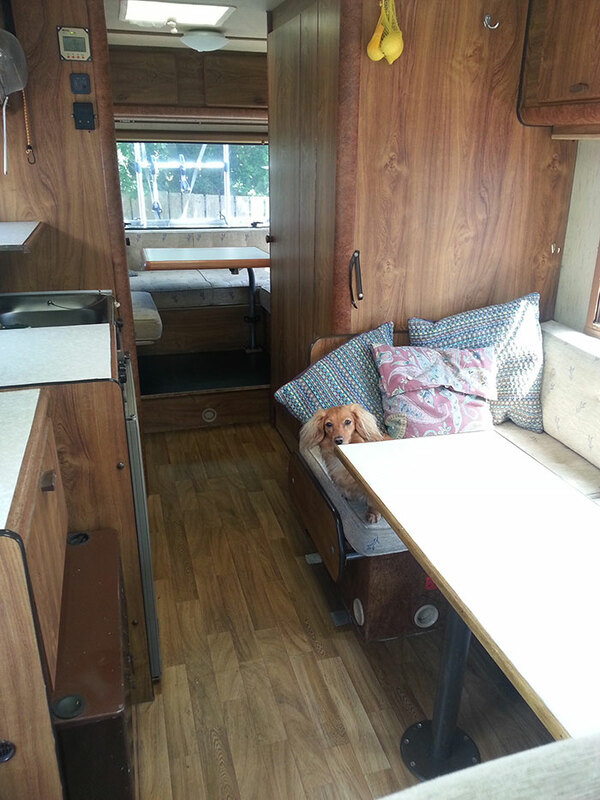 We now have a space we love to spend time in and hope she takes us far on our adventures! You look to have done a great job with this, and hope that you have a brilliant journey around Europe. Waiting to see all of these many paintings that you are going to do!!!! Do not forget Brocci will need a passport as well as you. Looks fantastic. A massive improvement on the original dull interior. Thanks Gale, we love it! It makes for a cheery mood inside instead of the darkness of before. Also when you have a dog that likes getting muddy paws it's good to have upholstery dark coloured and you couldn't do that when everything else was dark brown! What a lovely idea- Freda Roam, who thought of the name? I'm sure you will have a ball on your journey. Love to see and hear all about your escapades. Love your work! I watched your video of your van and would like to know how you store your pastels. In the video you have them in containers that snap together, can you tell me the make of the containers and where you get them from? Hi Sandy, The containers I use are made by a brand called Prym and I found them on Ebay. They come empty and I used my Unison pastel foam inserts from old boxes to line them. When they click together in little towers I can store them in the overhead lockers around me in the back of the van quite easily. I have lots of art supplies in these lockers and there is a surprising amount of storage space! For my paper and works in progress I built a storage box above the passenger seat (you can see this at 3.03 minutes in the video) which lowers down on a piano hinge for access. Being organised is key for me in here, but it's worth the effort! Thanks for visiting...I'll try and do a better video soon of my storage and tools. Thank you Emma, for the quick reply! Hi Emma, I saw your youtube video about the Prym containers. Like you, I always have to pack all my pastels after I finish working. That Prym seems to be the right answer for quick packing! I am wondering though, are they strong enough to carry all those pastels when it gets heavy? I saw some of the similar products but the review said that it's not strong enough and like to snaps. I'm also wondering, how do you get the extra containers? Do they sell the refill of the container or you just have to buy 3 layers like that? Many thanks! Hi Melita, The Prym boxes were bought off Ebay and you could buy individual trays as I've added to it over the years. It is surprisingly strong! I've had almost my entire collection in two stacks of trays with about 5 or 6 trays each. When all clicked together it seems able to hold a good weight and mine have seen about 5 years of constant use. Definitely a great job for when you have to pack up quickly which was every day for me.